Diamonds will take a break from their efforts to secure a play-off place in the Evo-Stik League South Premier Division Central when they take on Brackley Town in the county showpiece at Northampton Town’s PTS Academy Stadium (7.45pm kick-off). And it is set to be a stern test for Diamonds as they face a Brackley team who currently sit in third place in the Vanarama National League North and are well set to secure a play-off place for the second season in a row. 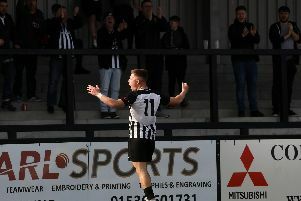 Both teams come into the final on the back of goalless draws at the weekend with Diamonds being held at home by Royston Town while Kevin Wilkin’s team returned from Southport with another point in the bag. And Peaks is hoping his team can produce a big performance as they look to seal the Hillier Cup for a second time, having won it when they beat Kettering Town 2-1 at the same venue three years ago. “It’s a massive game for us,” the Diamonds boss said. “We are up against a very good team and we will have to be at our best. “But I think we can go in and enjoy it. We will be the underdogs and there is no reason why we can’t go there and try to pass the ball on what will be an excellent surface. “If we are to enjoy the occasion then we need to be competitive and we need to be in the game. “It’s a chance to test ourselves against one of the better teams from the level above us. “But every time we have come up against a side from a higher league in competitions we seem to raise our own game and we will need to do that again. Should the game end in a draw, it will be decided on penalties.